I’m happy to announce that our book chapter, A process for surviving survey design and sailing through survey deployment, contained within Perspectives on Data Science for Software Engineering (eds. Tim Menzies, Laurie Williams and Thomas Zimmermann), is now available in press. The book chapter is intended for software engineering researchers and practitioners who are interested in deploying surveys within their organization. As an author, an interesting aspect of the writing process for this book is that the materials were developed and peer-reviewed collaboratively on the GitHub ds4se repository. For example, here are the reviews for our own book chapter from the drafting process. 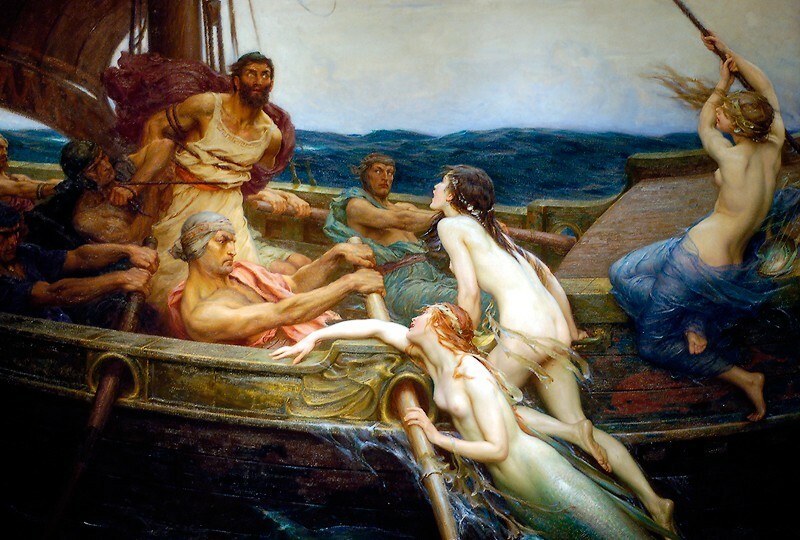 In the Odyssey, Odysseus and his crew must confront Persephone’s Sirens, creatures that sang in irresistible voices and lured sailors to their deaths. Still, adventurers risked the journey for the promise of knowledge, for through the Sirens’ song, “[o]ver all the generous earth [the adventurers] know everything that happens.” With guidance from Circe, the goddess of magic, Odysseus instructed his crew to plug their ears to deafen them from the song. He then had his crew tie him to the mast and commanded them not to release him under any circumstances. And so Odysseus and his crew navigated safely past the Sirens. Odysseus, having heard the Sirens’ song, sailed away a wiser man. Surveys, as with Persephone’s Sirens, are an attractive instrument that offer a similar lure of knowledge. Like Circe, we offer guidance, grounded in our own experiences, on a successful process for understanding the practice of software engineering through surveys. This year I’m able to attend the European Conference on Object-Oriented Programming (ECOOP) in Rome, Italy, thanks to generous travel support from the National Science Foundation. This will be my first time at ECOOP. I’m looking forward to meeting other researchers, building collaborations, discovering emerging research areas, and attending the ECOOP Summer School lectures to learn more about the formal and technical aspects of programming languages and tools. Our full paper, The Bones of the System: A Case Study of Logging and Telemetry at Microsoft, has been accepted to the International Conference on Software Engineering, Software Engineering in Practice Track (ICSE SEIP 2016). ICSE is hosted this year in Austin, Texas. Large software organizations are transitioning to event data platforms as they culturally shift to better support data-driven decision making. This paper offers a case study at Microsoft during such a transition. Through qualitative interviews of 28 participants, and a quantitative survey of 1,823 respondents, we catalog a diverse set of activities that leverage event data sources, identify challenges in conducting these activities, and describe tensions that emerge in data-driven cultures as event data flow through these activities within the organization. We find that the use of event data span every job role in our interviews and survey, that different perspectives on event data create tensions between roles or teams, and that professionals report social and technical challenges across activities. 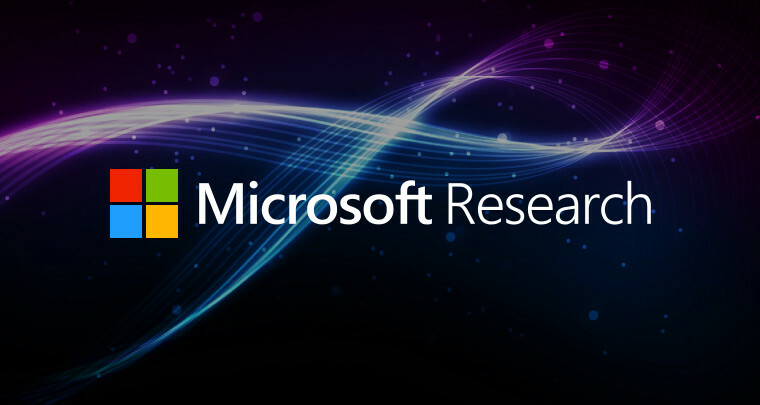 I am delighted to have been able to collaborate with Microsoft Research for this study. Thanks to Robert DeLine, Steven Drucker, and Danyel Fisher, the co-authors of the paper. Due to increased demands on my time and the need to minimize distractions, I am posting an official policy on my use of e-mail. Monday through Friday: 9 AM, 1 PM, 3 PM, 7 PM. If you send an e-mail after 7 PM, I will receive your e-mail at 9 AM the following day. Saturday and Sunday: 9 PM only. Weekends are reserved for time with my family. If you need to contact me urgently, you may send me a text message at 251-454-1579. I check Facebook once a week, usually on Friday night. Our short paper, I ♥ Hacker News: Expanding Qualitative Research Findings by Analyzing Social News Websites, has been accepted to the joint meeting of the European Software Engineering Conference and the ACM SIGSOFT Symposium on the Foundations of Software Engineering (ESEC/FSE 2015, New Ideas). ESEC/FSE is hosted this year in Bergamo, Italy. Grounded theory is an important research method in empirical software engineering, but it is also time consuming, tedious, and complex. This makes it difficult for researchers to assess if threats, such as missing themes or sample bias, have inadvertently materialized. To better assess such threats, our new idea is that we can automatically extract knowledge from social news websites, such as Hacker News, to easily replicate existing grounded theory research — and then compare the results. 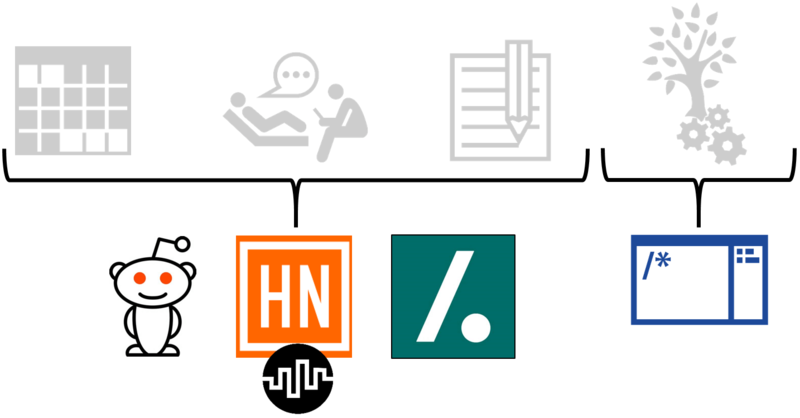 We conduct a replication study on static analysis tool adoption using Hacker News. We confirm that even a basic replication and analysis using social news websites can offer additional insights to existing themes in studies, while also identifying new themes. For example, we identified that security was not a theme discovered in the original study on tool adoption. As a long-term vision, we consider techniques from the discipline of knowledge discovery to make this replication process more automatic. 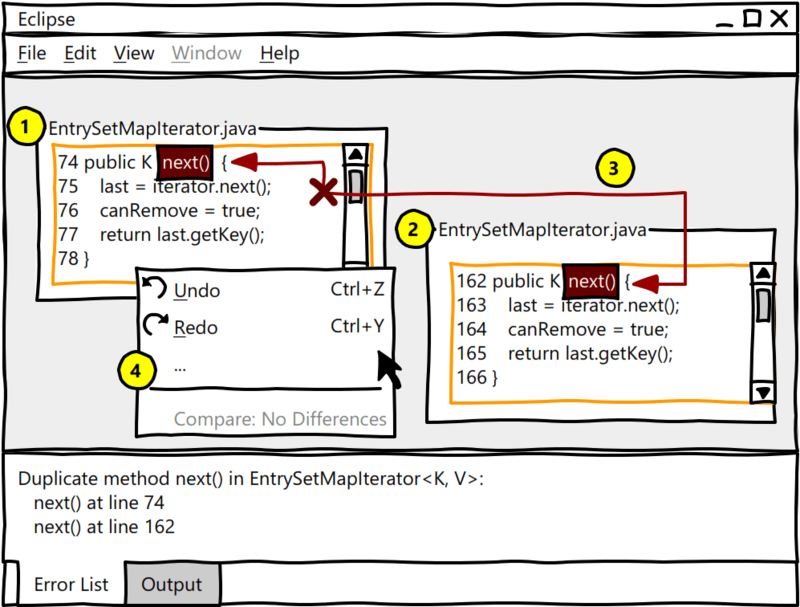 Despite the advanced static analysis techniques available to compilers, error notifications as presented by modern IDEs remain perplexing for developers to resolve. My thesis postulates that tools fail to adequately support self-explanation, a core metacognitive process necessary to comprehend notifications. The contribution of my work will bridge the gap between the presentation of tools and interpretation by developers by enabling IDEs to present the information they compute in a way that supports developer self-explanation. You can compare this submission with my prior VL/HCC Graduate Consortium. Our paper, Fuse: A Reproducible, Extendable, Internet-scale Corpus of Spreadsheets, has been accepted to the 12th Working Conference on Mining Software Repositories. Fuse is obtained by filtering through 1.9 petabytes of raw data from Common Crawl, using Amazon Web Services. See our Fuse Spreadsheet Corpus project page for details on obtaining the spreadsheets and using the spreadsheet metadata. Spreadsheets are perhaps the most ubiquitous form of end-user programming software. This paper describes a corpus, called Fuse, containing 2,127,284 URLs that return spreadsheets (and their HTTP server responses), and 249,376 unique spreadsheets, contained within a public web archive of over 26.83 billion pages. 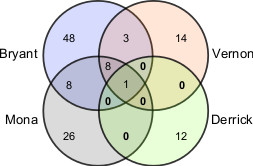 Obtained using nearly 60,000 hours of computation, the resulting corpus exhibits several useful properties over prior spreadsheet corpora, including reproducibility and extendability. Our corpus is unencumbered by any license agreements, available to all, and intended for wide usage by end-user software engineering researchers. 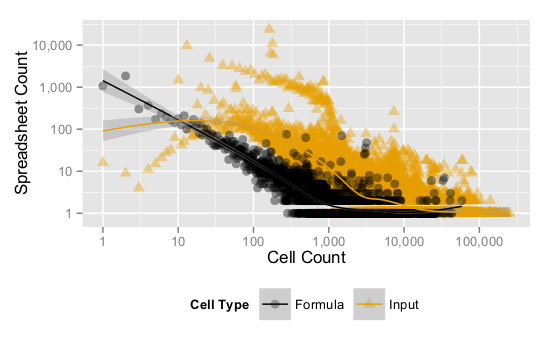 In this paper, we detail the data and the spreadsheet extraction process, describe the data schema, and discuss the trade-offs of Fuse with other corpora. Can Social Screencasting Help Developers Learn New Tools? Our short paper, Can Social Screencasting Help Developers Learn New Tools?, has been accepted to the 8th International Workshop on Cooperative and Human Aspects of Software Engineering (CHASE 2015). The workshop is colocated with ICSE, and will be hosted in Florence, Italy. directly observing peers’ workflows. However, these tool knowledge transfer events happen infrequently because developers must be both colocated and available. We explore an online social screencasting system that removes the dependencies of colocation and availability while maintaining the beneficial tool knowledge transfer of peer observation. Our results from a formative study indicate these online observations happen more frequently than in-person observations, but their effects are only temporary. We conclude that while peer observation facilitates online knowledge transfer, it is not the only component — other social factors may be involved.